York Place, Brighton, East Sussex. Grid reference: 531500, 104900, View on: Google Maps, Open Street Map, Streetmap, National Library of Scotland Map or Oldmaps. There are 2666 baptisms in the OPC database. IGI Batches: C147991 (1840 ~ 1850); C147993 (1872 ~ 1872). There are 4 monumental inscriptions in the OPC database. POWPics (The New Roughwood Church Album) contains 41 photographs of this church. This album will also display any postcards or other images of the church which are in the Sussex OPC database. There are 29 images of this church in the OPC database. Style: Gothic of Portland Stone. West tower with pinnacles. Chancel replaced in 1906 by Somers Clarke. The church of St Peter, of which the late Sir Charles Barry was the architect, was constituted the parish church in 1873. 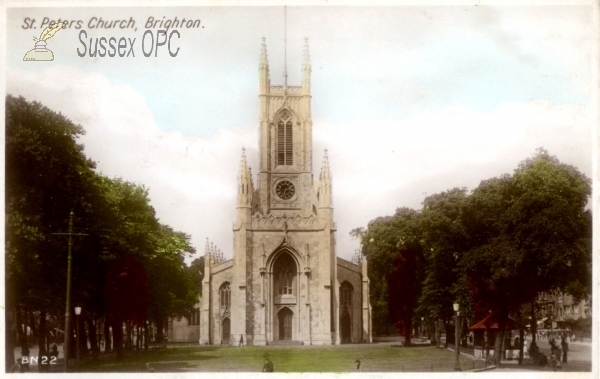 As the mediaeval parish church of St Nicholas proved too small for the growing population, St Peter's was consecrated as a Chapel of Ease in January 1828 by the Right Reverend Dr Robert Carr, Lord Bishop of Chichester, who, as Vicar of Brighton, had laid the foundation stone in May 1824. The first priest was the Reverend Thomas Cook who remained for 45 years until St Peter's became Brighton Parish Church in 1873. The font, made from Sussex marble, was given by his widow as a memorial to him. From the church website: http://www.stpeterschurchbrighton.org.uk/history.html,.